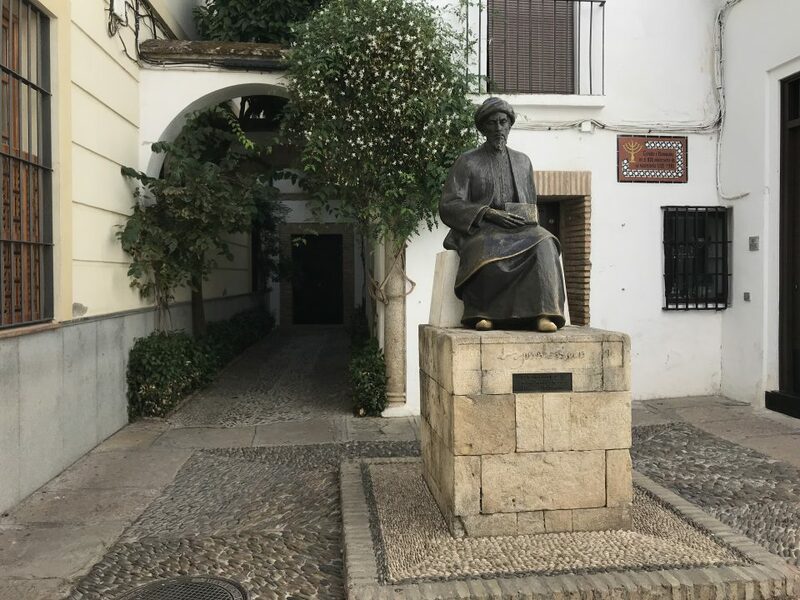 Cordoba was to be our destination for a day-trip from Seville. Mainly to see the Mezquita, Alcazar de los Reyes Cristianos and Puente Romano, but there were other things to see there too. 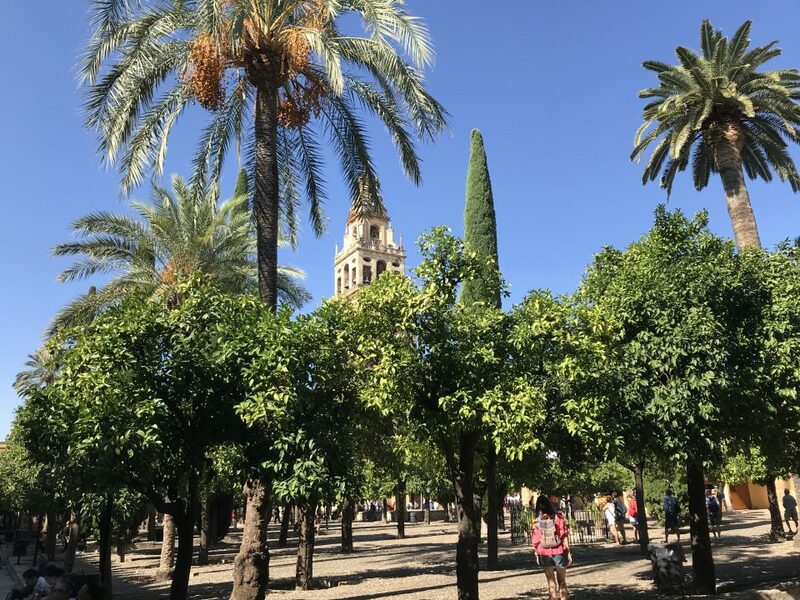 We had a great day in Seville yesterday, so we were hoping for an equally good day in the city of Cordoba. The weather was predicted to be hot again, so we took plenty of sun cream for my bald head. Wouldn’t want to have a fried scalp. 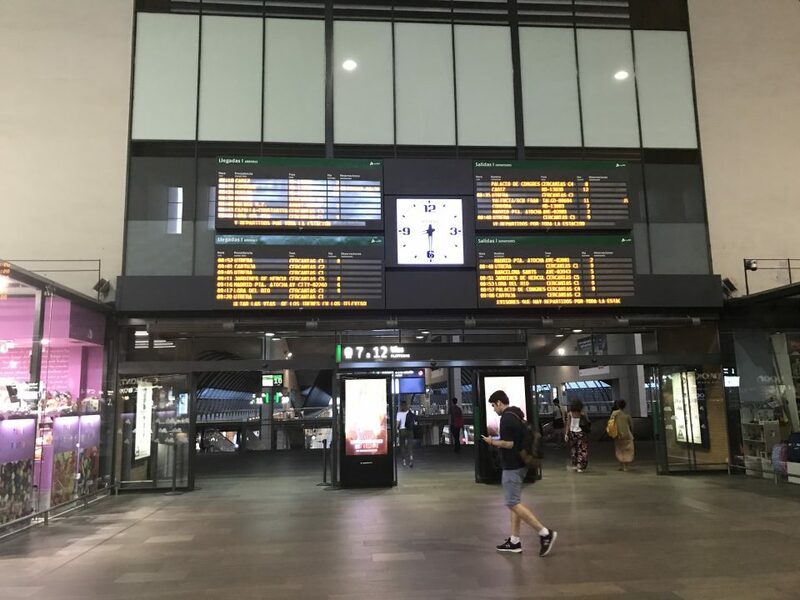 We were up bright and early to get the bus to Sevilla Santa Justa, where after a light breakfast, we boarded our train. From our experience Renfe Trains are always run with absolute precision and today was no different. You have two ticket checks and a security check before boarding. It’s a little bit like an airport, except you don’t fly. The train left on time too, unlike most flights I’ve been on. It took around 50 minutes to get to Cordoba, the scenery on the way was nothing out of the ordinary. In fact the wife fell asleep! On arrival at Cordoba Train Station, bus number 3 took us into the centre of Cordoba. 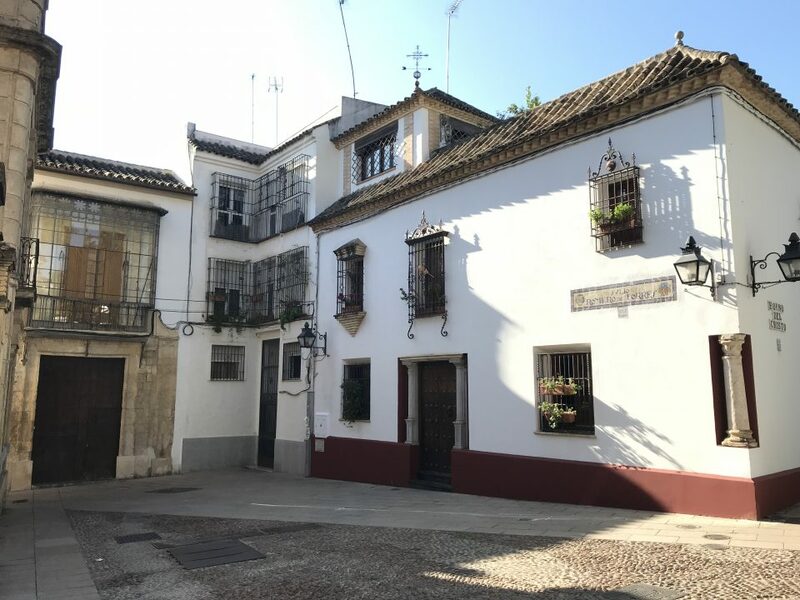 To start our visit to Cordoba we wandered around some of its narrow streets and plazas. It was so quiet walking around these streets you wouldn’t think you were in a big city. The streets were literally empty, devoid of life apart from a couple of dogs. That would soon change though. We enjoyed a coffee and an orange juice while taking in the view of Plaza de Jeronimo Paez. These were really peaceful patios with nice architecture and flora. The peace and quiet was disturbed only by Hayley pretending to be a parrot behind an empty cage. She should be served with an ASBO. The Mezquita is the main reason that thousands and thousands of tourists visit Cordoba. We paid our €10 each to enter and were instantly mesmerised by the beauty of the place. The Islamic art on the arches certainly reminded us of the Alhambra in Granada. The unusual thing about the Mezquita is that it mixes the religions of Islam and Christianity inside. 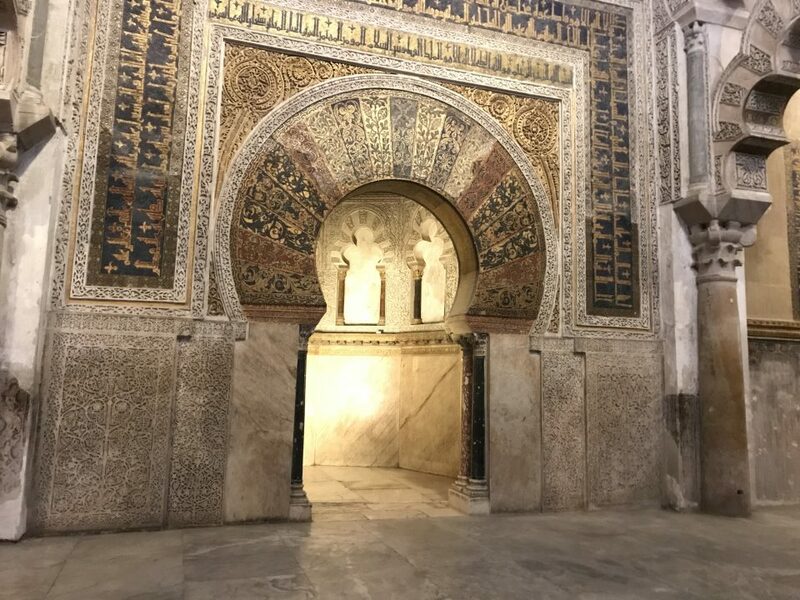 The main thing to see in the Mezquita is the Mihrab, which is a golden mosaiced prayer niche pointing towards Mecca. Back outside in the sun we took some time to appreciate the Mezquita’s patio. Despite the tourist crowds it was a beautiful sight to see and is filled with trees, fountains and a number of impressive gateways. The Mezquita’s Bell Tower overlooks the patio imposingly. Walking around the Mezquita was thirst and hunger inducing, so it was time for a spot of lunch. After 45 seconds of research we decided on Taberna Bar Santos. 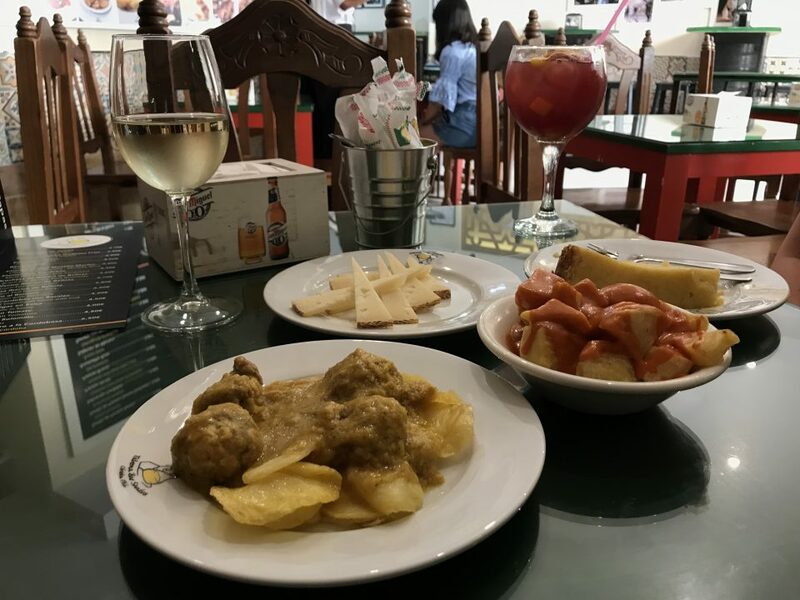 We ordered a selection of tapas including potato omelette, patatas bravas, cured cheese, Iberian pork kebab and meatballs. It was sumptuous feast especially when washed down with a dry white wine. I’m sure that it would be no surprise to anyone that knows us when Hayley opted for sangria. With the temperature rising to 31.7c we then proceeded to the iconic Puente Romana. Despite the heat it was a nice walk across this bridge with its 16 arches. Game of Thrones was also apparently filmed on here too, according to an elderly couple. 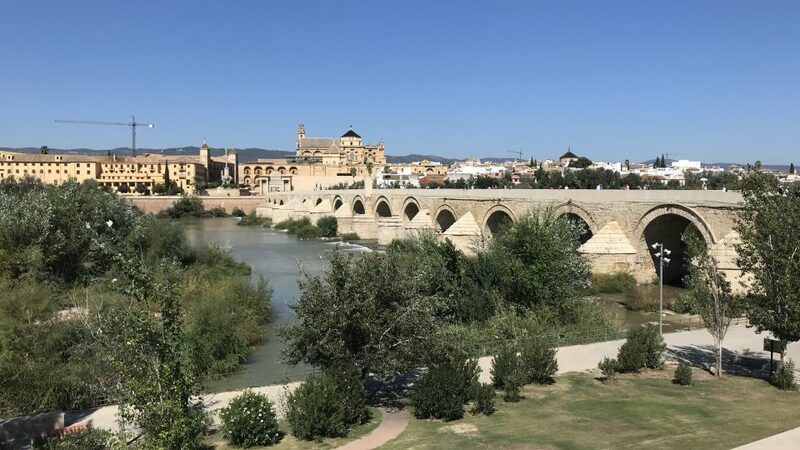 Once we crossed the bridge we sat down on a bench near the river and took in the view of Cordoba. We then retraced our steps back to the Mezquita and into Juderia, Cordoba’s Jewish Quarter. This area has a maze of tiny streets to explore, but is absolutely full of people and souvenir shops. It was quite difficult to find our way through it. Isn’t that the idea of a maze? Towards the centre of Juderia is a synagogue, but disappointingly this was closed for our visit. 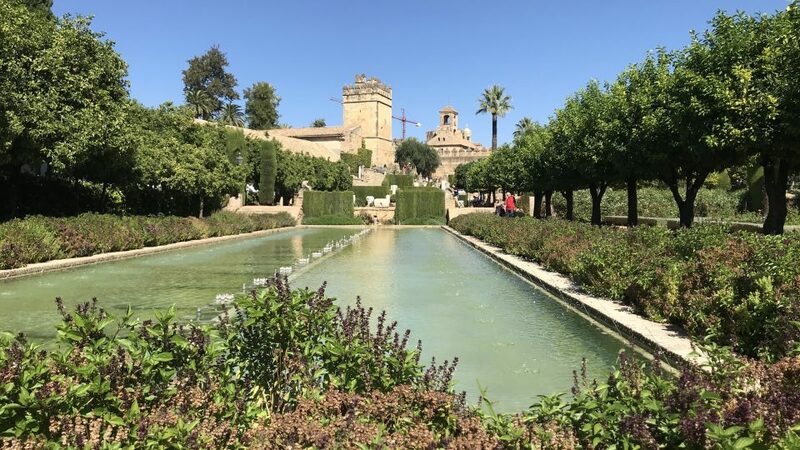 Our final stop on our Cordoba adventure was to visit the Alcazar de los Reyes Cristianos. It was built as a fort by King Alfonso XI of Castile in 1328 and forms part of Cordoba’s UNESCO World Heritage site. On the climb up to the top of the tower I couldn’t quite figure out what was worse, the sweat inducing steep ascent or the wife complaining about it. However, the view at the top were definitely worth both inconveniences as you could see all of Cordoba’s key attractions. We then walked around the Alcazars garden with trees, flowers and pools. It was a great way to end our day in Cordoba. It was then time for our train back to Seville before another day of exploring. Finally, did you enjoy this blog? 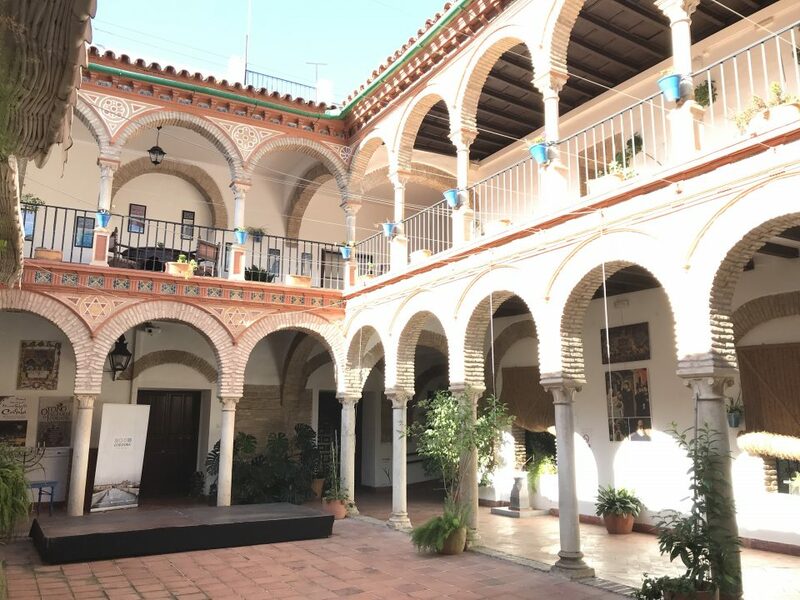 Or if you have already travelled to Cordoba? Do you have some other suggestions to share? Then remember to leave a comment. atravellingjack makes me jealous. Polly sounds cute ! !